TLDR: This is just a speculative post about a paper which is interesting from the Protons point of view but is not really related to anything else. It is interesting on many levels. At the most basic, it gives you the actual concentration of glucose used to grow the cancer cells. This is pretty unusual. The basic idea of the commentary, partly agreed with by Catalina-Rodriguez, is that genetically inducing the Warburg Effect in cancer cells kills them. This is obviously very compatible with Lisanti's ideas, that cancer cells generate ATP via ox phos, and is the diametric opposite of the Warburg Effect. But the paper by Catalina-Rodriguez, while it does discuss the Warburg Effect, also provides enough information that other explanations are tenable beyond those supported by Lisanti. Anyone looking at Lisanti's work without considering other explanations needs to be more circumspect. The paper is all about the mitochondrial citrate transporter, CIC. We had better put CIC in to context first. It exports citrate from the mitochondria to liberate mitochondrial derived acetyl-CoA to the cytoplasm for anabolic processes. It's an antiporter, it exchanges citric acid for malate. Citrate out, acetyl-CoA released, residual oxaloacetate reduced to malate via NADH, malate re enters the TCA. So CIC exports citrate and imports malate. Because citrate carries 3 negative charges and malate only two, a proton is carried out with the citrate which maintains electrical neutrality but generates a pH gradient. 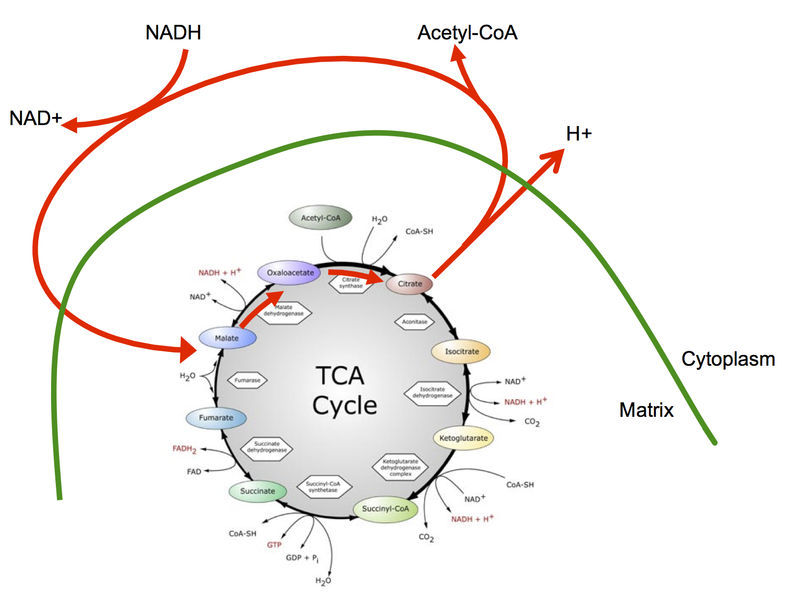 It's also clear that a cytoplasmic NADH is consumed converting oxaloacetate to malate and this is regenerated within the mitochondria by the TCA as malate reconverts back to oxaloacetate. It bypasses all of the energetic processes in the rest of the TCA so delivers very little to the ETC. 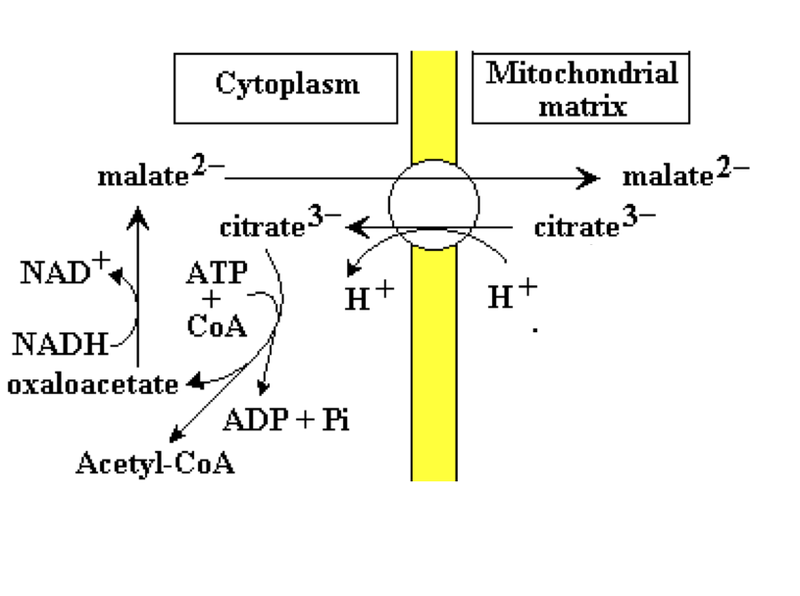 The normal function of this pathway appears to be a safety valve for the cell when the mitochondria are presented with far too much acetyl-CoA. In some cancer cells things go very awry. Two hallmarks of cancer cells appear to be abnormal electron transport function and free radical leakage from the ETC. The free radical leakage is at levels which cause proliferation rather than apoptosis. Complex I primarily reduces NADH to NAD+. If we have a dysfunctional complex I (either directly or by poor function downstream in the ETC) there is going to be a great deal of NADH per unit NAD+ within the matrix. High levels of NADH inhibit isocitrate dehydrogenase and so drive citrate export in to the aberrant CIC cycle. The cost is limited to one imported cytoplasmic NADH, the benefits are reduced generation of TCA derived NADH and FADH2... Plus cytosolic citrate is an inhibitor of glycolysis, so works as a brake on the excessive supply of pyruvate derived acetyl-CoA. So some degree of poor ETC function can be accommodated by exporting acetyl-CoA rather than turning the TCA. 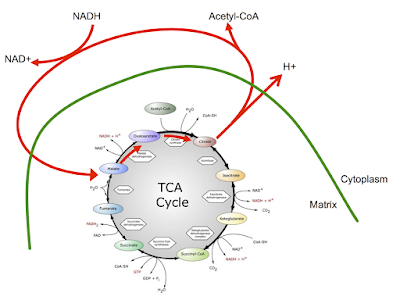 The red cycle in the above doodle predominates and the TCA is almost inactive. Under these conditions the mitochondria are largely protected from their dysfunctional electron transport chains. There are ROS (mostly superoxide) being generated but at levels which are not fatal to the cell although they can drive mutagenesis, in both mitochondrial and nuclear genomes. What happens if you inhibit CIC in a cancer cell which is using CIC to both limit ROS production and to deliver cytoplasmic acetyl-CoA for anabolism? 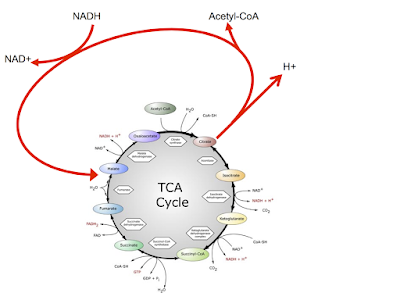 The whole extra-mitochondrial cycle should shut down, meaning acetyl-CoA has nowhere to go other than around the TCA. Less citrate can be exported, so cytosolic citrate levels fall. 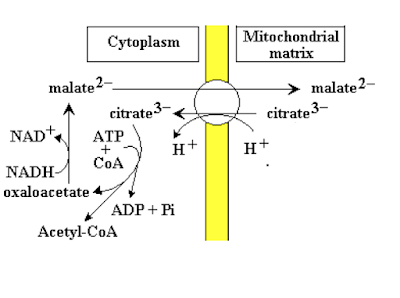 Falling cytoplasmic citrate allows increased glycolysis and this can feed even more acetyl-CoA in to the TCA. Complex I is still dysfunctional so we are then in to a massively elevated NADH:NAD+ ratio. We will also increase FADH2 driven CoQ reduction via complex II as the TCA turns. A high NADH:NAD+ is the prerequisite to getting an electron on to an oxygen atom to generate superoxide in complex I, back in Protons (22) I speculated this might be at FeS N-1a. A reduced CoQ couple also drives this via reverse electron transport. Putting an electron on to oxygen aborts all of its downstream proton pumping. What might happen if a very high percentage of electrons jumped ship at complex I due to a grossly elevated NADH:NAD ratio and a reduced CoQ couple? Increased superoxide, more oxygen consumption (though not necessarily at complex IV), much more ROS. Might the ROS release cytochrome C by oxidation of its cardiolipins, so giving collapse of the mitochondrial membrane potential and triggering apoptosis? My idea would be that pyruvate is toxic because it bypasses glycolysis so cannot be shut down by the glycolytic inhibitory effect of raised cytoplasmic citrate. There is a spike of acetyl-CoA which cannot be avoided and which CIC levels are not set up to deal with. 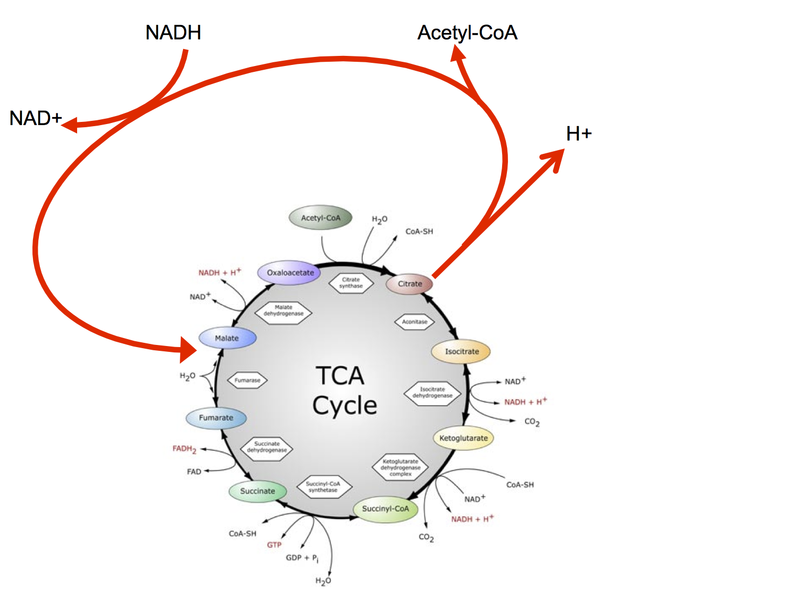 More acetyl-CoA enters the TCA, more NADH, more superoxide from complex I... 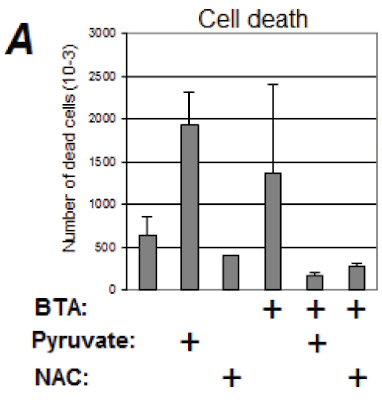 The authors focus instead on the fifth column where pyruvate rescues cells from BTA toxicity. I can see no logic to this and have no explanation for that particular result. At least I do actually mention the results which don't fit my hypothesis! The next very interesting result is the effect of uncoupling. CCCP is an uncoupler which reduces the MMP. This leads to mitophagy +/- apoptosis. A functional CIC cycle saves cells from CCCP damage. You could argue that CIC is just a Saviour of Distressed Cells. But on a more interesting level: Uncoupling normally markedly increases electron flow down the ETC. In normal mitochondria this reduces ROS generation. But if the ETC is leaking electrons to generate ROS under even normal flow it's easy to see why uncoupling can allow massive ROS generation. CIC is protective because it keeps electrons out of the ETC. They also found that CCCP induces CIC production. My assumption would be that CIC is induced by ROS and CCCP generates ROS. The same thing happens with rotenone by the opposite process. Rotenone does not uncouple, it blocks the ETC at the exit of complex I. This gives reduced conversion of NADH to NAD+, markedly increase the NADH:NAD+ ratio, electrons jump to O2 to N-1a to form superoxide... CIC induction is the solution to limit this. There are some very interesting results here. I have absolutely nothing against looking at CIC inhibition as a management for certain subgroups of cancers. 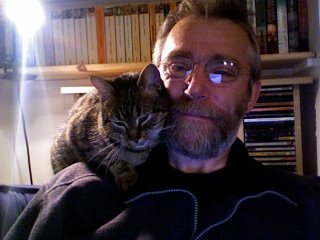 It may well help, but thinking about what is actually happening might give more insight. In this context and with the intention of starving cancer, any idea whether Nicotinamide Riboside would be productive or counterproductive? - Mitochondria are in charge of apoptosis. - Thus they tend to be small cells because they depend on glycosis (which is enhanced if sugar is elevated.) They seem to have trouble doing respiration.